Help, There's a Werewolf in My Map! There’s something wrong with this map. Can you see what it is? Take a few seconds. Yes? No? It might help you to know that this map of Ireland and the UK was cropped from a movie poster (reproduced in its entirety below). Nothing yet? Think of What’s on a Man’s Mind, the famous optical illusion showing either Sigmund Freud in profile, or a naked lady - whichever your brain chooses. That caricature is a clever illustration of Freud’s theory that the libido is a prime motivator of human behaviour (1). This map of the British Isles is a similar dual-use image. By now you’ll probably have seen the anomaly; and if you are somewhat cinematically inclined, you might have guessed which movie we’re talking about. Still nothing? Okay. Here are a few more hints. Full moon. Bad hair nights. A-oooow! If the image continues to elude you, like those last few squares of sudoku, then don’t read on. Unless you want to find out that this map is from a relatively rare poster for An American Werewolf in London, arguably the best horror/comic film ever made (2). One of the most memorable scenes in the movie is the transformation of the protagonist from hapless backpacker to raging lycanthrope. Its metamorphosis near-completed, the American werewolf raises its stub-nosed head to howl in rage and pain. This is the iconic image of the movie, reproduced on many of the wide range of posters advertising the movie (3). This map shows a cartographic take on that howl. It transforms the normal map of the British Isles (4) into a likeness of that almost-finished werewolf. Finally, lycanthropy and cartography meet! The area of transformation centres on the Irish Sea. The river Liffey, which springs south of Dublin in County Wicklow, is redirected north and provided with a hairpin bend near its new source. If one considers Ireland on its own, this almost looks like a smile. When seen together with the topographical transformations further east, it makes a pointy werewolf ear. Coastal indentations in the northern half of Wales mutate into a ferocious mouth, complete with razor-sharp teeth. The Isle of Man is remoulded to resemble a squinting eye, and a new island is placed before Lancashire’s receded coastline to coincide with a were-nostril. Or maybe this is the Isle of Wight, towed up from its normal position on the southern coast of England. All in all, a clever image: the map’s mutation mimics that of the American werewolf itself. The relatively small changes on the map make it all the more powerful - who can now look at the regular map of the UK and Ireland without recalling this one? 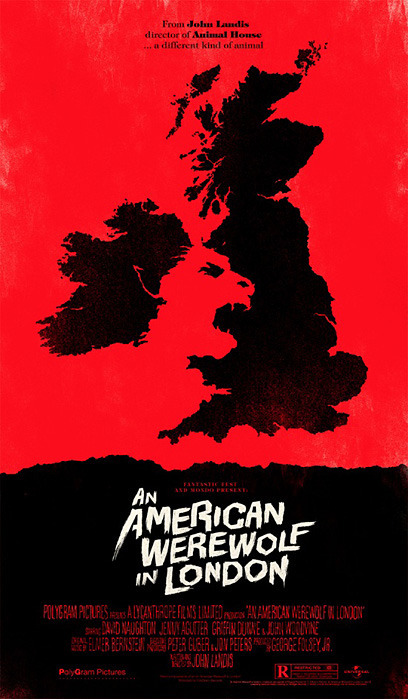 And of course the werewolf’s head is directionally correct, coming from the west (America) to take a bite out of Britain. Many thanks to Patrick Dea for sending in this map, found here on Tumblr. (1) as opposed to the desire, c.q. the moral obligation to do good (see Plato, Jesus), or the will to power (see Schopenhauer, Nietzsche). (2) in 1981, by John Landis. Happy thirty-fifth anniversary, Werewolf! (3) a cursory internet trawl for ‘American Werewolf movie posters’ shows how diversely marketed one single movie still could be back in the early Eighties. A wide variety of artwork, from photo collages to original paintings was produced, each for a different national audience. (4) Topographically, the term British Isles includes Ireland, which is a bit awkward, as the south of Ireland, by its very republic-ness, is not British at all.